As soon as the new theme came out I immediately wanted to do something as an homage to our groupmembers. We gather online from all over the world, are all very colorful people, who are working with different kind of fabrics. All this I wanted to translate in fabric. I started by painting 3 different colors of gold with a stencil on black cotton. I then made a simple , kind of abstract, human shape in different sizes. Some of us are more in the foreground than others. Like it is always in a group. 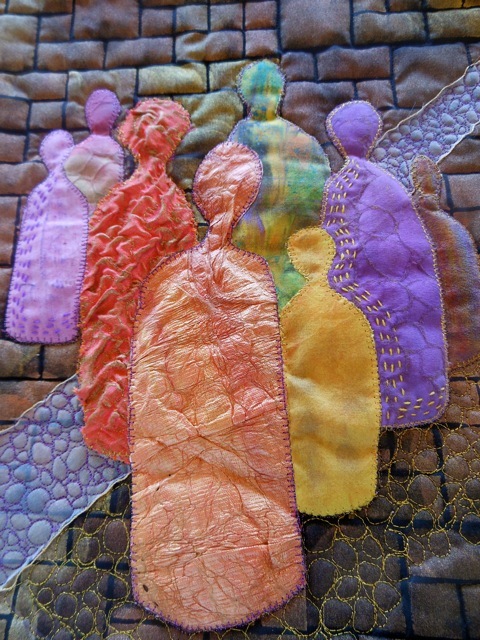 The shapes are sewed onto the background with a machine blanketstich with gold metallic thread. I didn’t make 15 shapes because that would be to much, but in the right upper corner I made 3 more shapes with shiva paint stick and painted Wonder under, to resemble our shadow group. We are connected by a kind of road. 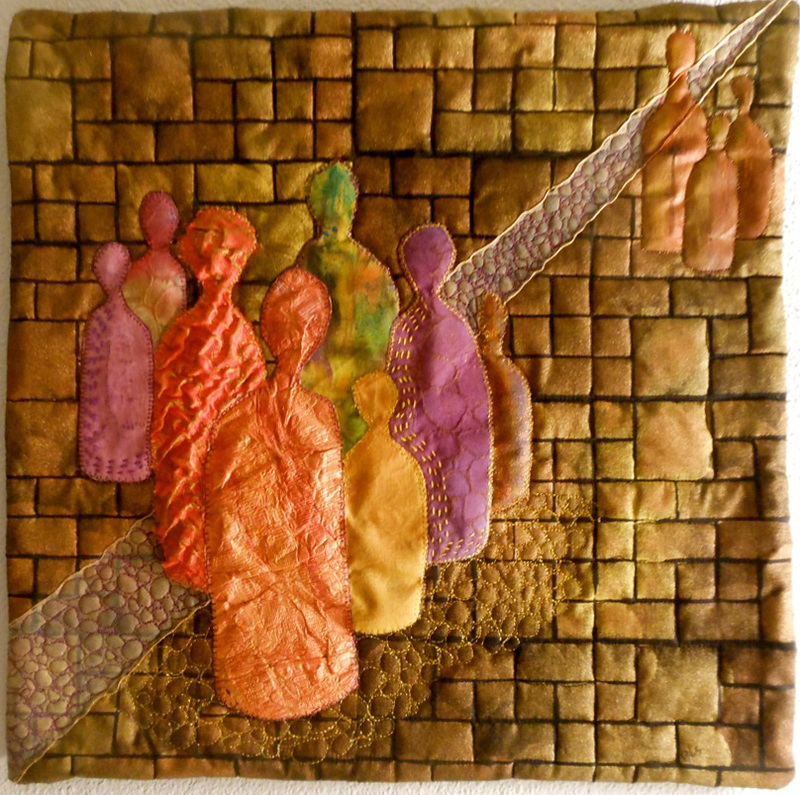 I first stitched the golden lines by hand and later filled it in with a kind of organza and free motion quilted pebbles with gold metallic thread. I did the same pebbles under the shapes as a kind of shadow. By hand I made some shade in the human shapes as well and machine quilted in the black lines of the background. I really loved working on this theme. Els I love your quilt and especially how you have treated the theme ! You lovely quilt inspires me to want to try using unusual materials in the future. Great job! I am intrigued by the narrower path of the group against the larger road…the world at large?